The diagram above is from Jim Bunch’s company, The Ultimate Game of Life . 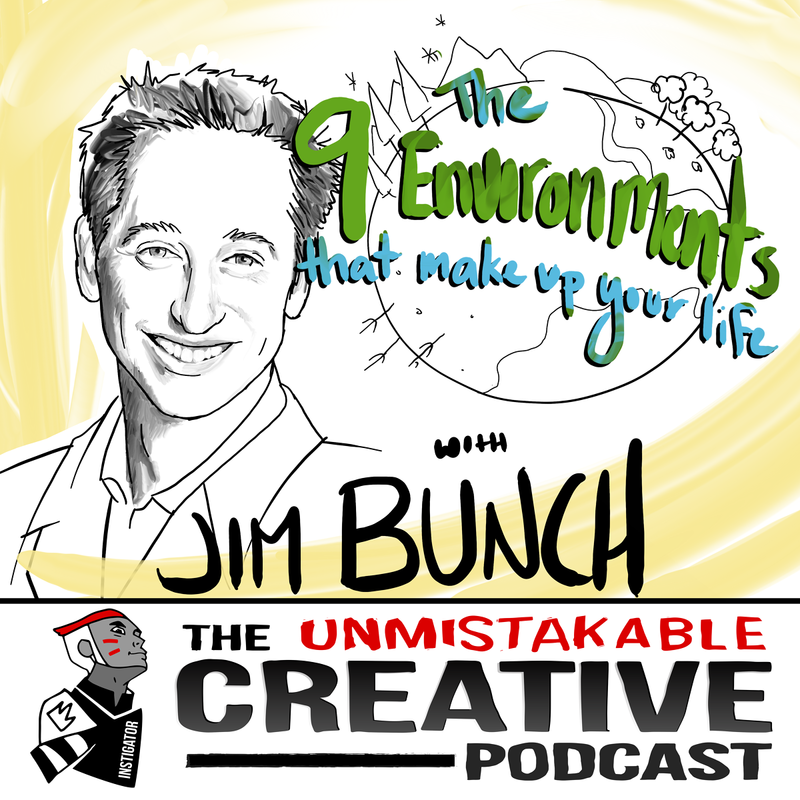 I was initially introduced to the idea that our life is made up of environments in a conversation I had with Jim on the Unmistakable Creative about designing environments for optimal performance and creativity. When you view everything, not just your physical space, but the people you talk to, the information you consume, the clothes you wear, and the food you eat as environments, you develop both a heightened sense of awareness and sensitivity to the impact of those environments. You become ruthless about upgrading the quality of those environments. If you’d like to follow along this article while doing an audit of your own 9 environments, you can download it here. When most of us think of environments, the first thing we think of is our physical environment. This includes the spaces we live or work in, the cars we drive, the clothes we wear and even the devices we use. My first stop in tidying up my own life was my bookshelf. Over the years, I had purchased and received many books. Most of the books that didn’t spark joy were about social media marketing. I got rid of them. Most of the books that were left were published by Penguin. A few days later my editor at Penguin contacted me about writing a book with them. It might just be a bizarre coincidence, but after that, I was sold on the impact of environments on my life. Another thing I learned from Jim was the power of keeping your car immaculate. Let’s face it. When you sit down in a car that’s clean, you just feel better about everything. That was the end of receipts, wrappers, etc. This isn’t hard to implement. Anytime you stop at a gas station, toss whatever should be trashed. Just think about how annoying it is when you crack your iPhone screen and use it like that for days. In the work that Jim Bunch does, this is referred to as a toleration. And tolerations drain energy from our physical environment. The value of a nice notebook or a new Macbook isn’t just in the fact that you have something that looks nice. It literally impacts how you feel. The upgrade of my wardrobe has been kind of a work in progress until I heard some things that really convinced me of the virtues of dressing better. My friend Mike Harrington said “It’s probably best to dress better when you get on a flight. You never know who you’re going to meet at the airport. In many tech companies in Silicon Valley, for example, there is casual anything goes attitude toward style and self-presentation at work. However, just because you can show up to work unshaven in a hoodie and shorts doesn’t mean you should. We all have a superficial side, and to imagine that the people who have influence over your career (including your customers, if you’re in business), are not making superficial judgments about you, based on your appearance, is to assume too much. Last but not least my business partner Brian Koehn talked about how many items in our lives create subconscious associations to our past. I tossed out shirts, shoes, and jeans from a particularly dark chapter of my life and ordered new ones. This doesn’t just apply to clothes. The next environment that we deal with is our physical body. I’m not a nutrition or fitness expert, but if you spend a few straight days going to the gym, you’ll be convinced of the virtues of exercise. Add eating well into that and you’ll be amazed what happens to your productivity and creativity. For additional information on upgrading this environment, check out any of the following websites. Our memetic environments consist of the books we read, the podcasts we listen to, the websites we visit, and all of the information we consume. This is why I say you have to treat the information that you consume like the food you eat. The reason I don’t engage with commenters who hate my work is because doing so would be toxic to my memetic environment. This is also a pattern I’ve observed in other prolific creators. The same energy spent debating somebody who hates my work could be put into creating something for a person who loves it. I’m not religious. My main issue with religion is that is time-consuming, especially if you’re Indian. If you’ve been to an Indian wedding you know this. And if you’re not Indian but were invited, you should know the ceremony was shortened because of your presence. Keep attending your Indian friends’ weddings. That being said I am spiritual. I do believe that there is some greater force than ourselves. And I do believe there is value in a strong spiritual environment. My spiritual practice centers around surfing. The ocean is my church. After years of trying, I finally developed a meditation habit. One of my mentors used to be incredibly reactive. In the time I’ve know him, I’ve witnessed an incredible ability to remain calm in high stakes situations. He attributes this to a daily meditation practice. Whatever that is for you, whether it’s in the form of religion or philosophy, I think that’s a good thing.A spiritual environment that’s in good condition keeps us grounded. Your financial environment is exactly what you might imagine it to be. Your bank accounts, your investments, etc. etc. Even though I spend quite a bit of time thinking about the financial environment in my life, I’m not qualified to tell you how to upgrade yours. Below I’ve listed resources that I’ve been exposed to from my friends. Often this is the environment we want to improve the most. If there’s one thing Jim Bunch taught me it was to work on the environments that you could immediately make upgrades to. The people that we spend our time with, our friends, our relatives, and our co-workers have a profound impact on our lives. If they’re toxic and constantly negative, they will hold us back. I have friends who unfollow anybody who is constantly negative on social media. In some cases, they go so far as to banish them completely. Be the Soup Nazi of positive energy when it comes to your relationships. When you remove toxic people from your life, you’ll be amazed at how much energy you gain. It’s like lifting the weight of the world off your shoulders. I view my network as an extension of the relationship environment. Every single day we are immersed in various environments known as networks, communities, and tribes. All of the networks you participate in online are a digital environment. With the internet, we have more ability than any other time in history to shape our network. Make a list of all the interesting and influential people you’d like to learn from and follow them on twitter. You’ll learn what they’re working on, who they’re connected to, and what books they’re reading. For example, I followed Chris Sacca after his appearance on the Tim Ferriss podcast. Then he retweeted the reading list of John Collison at Stripe. As a result I’ve been exposed to the ideas of two smart people without knowing them personally. Nature is an environment we interact and deal with on a daily basis. When we spend our days going to work when it’s still dark, breathing recycled air, and then leaving when it’s dark, it’s terrible for us. Immersing yourself in nature in some way or another on a daily basis is essential for your physical, mental and emotional health. Consider taking up an outdoor hobby like surfing, snowboarding or hiking. It beats the hell out of being someone who stays out drinking until 2am. I can tell you that from experience. When you have meetings, consider doing a walking meeting. Mark Zuckerberg, Steve Jobs, and many others conduct walking meetings. In his post about why successful people spend 10 hours a week just thinking Brian Scudamore even talked about walking in nature. If you live in a location where the weather doesn’t permit you to be outside too much, consider taking a short walk. Just get up from your desk and breath some fresh air. The self environment is your personality, your strengths, your weakness and everything that makes up who you are as a person. There are several ways that you can begin to make upgrades of your self environment. See a therapist: For a long time, I thought therapy was only for crazy people. But the more I heard people like Jerry Colonna, friends of mine and several others talk about it, the more convinced I was of its value. 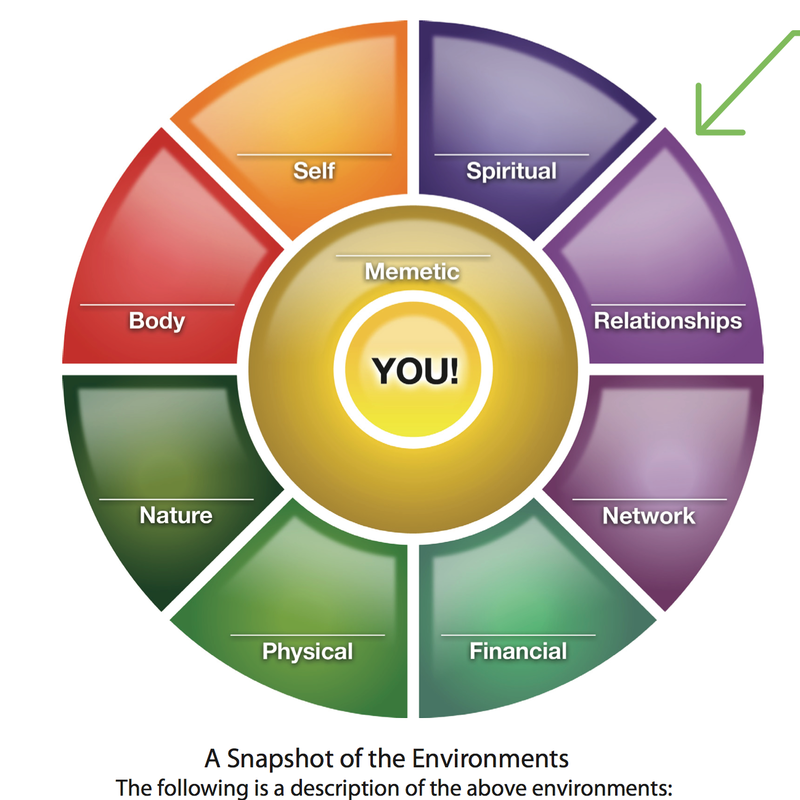 If you’d like to do a self-audit of your environments to understand exactly how your own 9 environments are helping or sabotaging your growth, sign up here and I’ll send it over. Much like changing habits, your best bet is to attempt this one at a time. Take any component of the system, and by improving it, you positively impact all of the other components. A few months ago I bought a pair of Beats Headphones for 99 bucks. On the surface what seemed like conspicuous consumption was one of the best investments I’ve made in my productivity. Given that I am a writer who works from coffee shops on occasions, they were more of an investment than an impulse purchase. There are many things that might appear to be conspicuous consumption but might actually be an investment in your success. As Tim Ferriss said in this animated short below, what makes someone truly wealth is not just money, but holistically having the life you want. I’ll leave you with these final words that Jim shared with me. If you get fanatical about designing environments, the environments will do the work for you. You no longer have to depend on willpower.